Drunkcow landmines are wickedly-unusual-but-oddly-believable stories that have been passed along by someone who believes the story to have happened to a friend of a friend. 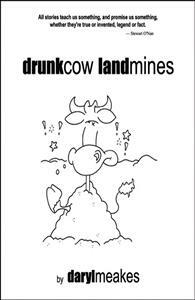 Drunkcow landmines are cautionary tales that reflect current societal concerns and fears as well as confirm our world views. They warn us against engaging in risky behavior by pointing out what has supposedly happened to others who did what we might be tempted to try. Whereas, others confirm our belief that it's a big bad world out there -- one awash with such boogeymen as, ex-lovers, unscrupulous companies, and George W. Bush. Meakes mix of humor with real-life situations demonstrates he has a fresh and true voice that will affect you, disturb you, and make you laugh. He will not, however, leave you cold. Daryl Meakes has proven himself one of this years funniest new writing talents and is well on his way to having a strong career in the literary genre of humor.